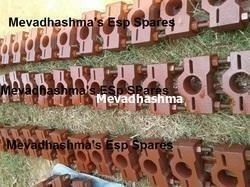 We are capable to supply suitable for Chinese, suitable for Alstom, suitable forBHEL Electrostatic Precipitator Spares for power plant, esp power plant, power plant esp spares, esp boiler spares, bhel boiler spares, all use of electrostatic precipitator parts, boiler esp spares, esp plant spares, power plant esp spares, flakt electrostatic precipiator spares. The all parts of esp like esp foundation bolt, slide bearing, bearing housing, esp dust bearing, esp fixed bearing, esp plain bearing, esp inner arm assembly, esp outer arm assembly, esp hammer assembly, collecting electrode clamp, collecting electrode plate, esp emitting electrode, spiral emitting electrode, spiral discharge electrode, pipe and spike type electrode, rapping plain bearing, rapping inner arm, collecting rapping outer arm, emitting rapping outer arm, rapping shaft sleeve, collecting shaft, emitting shaft, collecting rapping cluth, collecting rapping coupling, esp set ring, collecting shock pad, esp rapping pinwheel, esp grip coupling, esp grip coupling, esp vertical bearing, esp thrust bearing, esp emitting trust pad, angle shock bag guide, esp rod shock bar guide, esp shock bar, casing man hole door, gas distribution plate, gd screen. Owing to our rich industrial experience in this domain, we are committed towards offering wide gamut of Electrostatic Precipitator Plain Bearings. Our given range of precipitator plain bearing is manufactured in adherence with predefined guidelines & advance technology. We offered this precipitator plain bearing in different specifications to our customers. This precipitator plain bearing is valued in the industry owing to its optimum quality. We feel proud to introduce ourselves as the leading manufacturer, exporter and supplier of a superior quality Bhel ESP Screen Plate Secondary. Provided screen plate is offered in different specifications as per the requirements of clientele. This screen plate is developed with the help of competent workforce using high quality raw material and leading technology. Offered screen plate is high on demand among our patrons due to its indispensable features. We are instrumental in offering a wide array of Emitting Electrodes for ESP. 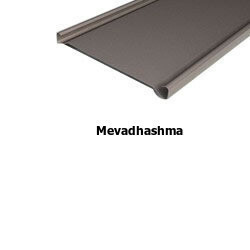 The offered emitting electrode is manufactured from the high-grade factor input as per with the industry norms. We offer this emitting electrode in a number of specifications so as to meet the demand of customers. Our quality controller inspects this emitting electrode on different parameters in order to make certain its performance. 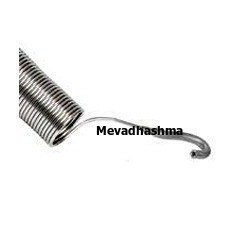 Mevadhashma offers Emitting electrode and Discharge Electrodes are high standard and installed and working all top major industries with statisfied customers. We also advised our customer to install the emitting electrode for esp to be used in stretching device. With support of our excellent team workers, we have been delivering the best quality range of ESP Collecting Electrodes. Our given range of electrode is manufactured in adherence with predefined guidelines & advance technology. We offered this electrode in different specifications to our customers. 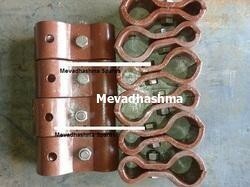 This electrode is valued in the industry owing to its optimum quality.